Have you finished your 12th class and looking for Govt Jobs? then this is the right place for you to apply online for 12th Pass Govt Jobs 2019. Check the complete details like latest recruitment notifications, job roles and much more. 12th Pass job seekers can fill the online application forms for multiple posts in various departments like Bank, Railways, Airlines, Police Department, Postal Circles, Indian Coast Guard, UPSC, DSSSB, NALCO, HAL, TSPSC, PGIMER, Indian Air Force, Indian Army, BARC, RMRC, GACL etc from this page. Check the below table and find the suitable organization and click on the apply link. Verify all the information and apply. Through this page, all job hunters who are looking for the 12th Pass Jobs for Freshers. There are many Government Jobs for 12th Pass available. Check this entire post. And then apply for the 12th Pass Latest Government Jobs 2019. With the help of this article, candidates can also check about Government jobs for 12th science pass, 12th pass job in railway, Govt jobs for 12th pass in Banks 2019, Government jobs 12th pass arts, Govt jobs for 12th pass commerce student. In this article, job hunters can check the latest Job Openings related to 12th Pass Govt Jobs 2019. An enormous number of posts such as Medical Officer, Lab Technician, Staff Nurse, Forest Ranger, Village Employment Assistant, Technical Assistant, Driver, Multi Purpose Assistant, Forester, Account Officer Grade II, Navik, Lecturer, Junior Engineer, Post Graduate Teacher, Trained Graduate, Constable, Data Entry Operator, Lab Technician, Project Attendant, Junior Assistant and much more vacancies are available in the various organizations. We know that different candidates have a different opinion about the 12th Pass Government Jobs 2019. 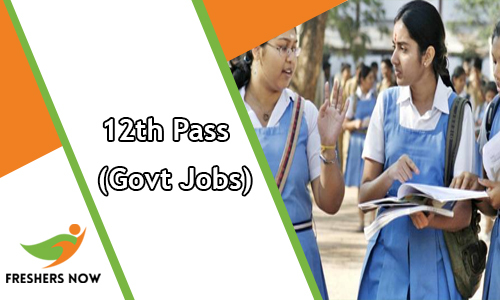 Check the latest 12th Pass Govt Job Openings 2019 from this page. Back Office Executive, Detailed Executive, Custom Brokerage Manager, Back Office, Verification Officer, Sales Officer, Tele Caller cume loan officer, stock broking etc are the main job openings for 12th Pass Candidates in Banking Sector. We know that 12th Pass Govt Jobs 2019 assures a smooth life along with the job security. This current article gives the latest 10th Pass Government Jobs 2019 in a detailed manner. A common recruitment for 12th Pass candidates is SSC Recruitment. Not only SSC there are a lot of organizations are hiring the 12th Pass aspirants. We suggest to the contenders check the positions and apply before the last date. In this page, aspirants can check the 12th Pass Govt Job 2019, Govt Jobs for 12th Pass in Banks, 12th Pass Govt Jobs for Females, 12th Pass Jobs 2019 in Airport, Railway Jobs 2019, Bank Jobs for 12th Pass online form, 12th Pass Indian Railway Jobs 2019 etc. Many of the female job seekers are eagerly waiting to check the latest list of 12th Pass Government Jobs 2019. For those candidates, the current page gives an overview about the latest and upcoming openings. Those contenders who have stopped their education after 12th Standard can get the good news from this page. At present situation, there is a huge demand for 12th Pass Govt Jobs 2019. The younger generation has a much interest in Government Jobs. Nowadays there is a large crowd of 12th Pass Government Jobs 2019. Most of the people are thinking that Govt Jobs is better than the Private Jobs. Well, every candidate can get the attractive pay scale from the authority. Aspirants can receive the monthly salary on time plus incentives. According to this people love the Government Jobs more than private jobs. Because they can get their pay scale guarantee. Also, people can get the pension until you die. This is a very good news for the aspirants because it is a complete insurance of your life. These benefits are applicable for all the 12th Pass students. From the above section, we have given the various departments and different job roles for the sake of candidates. So check the information once and apply for 12th Pass Govt Jobs 2019. It really doesn’t matter whether you have any skills or not. All you need is proper preparation. We are sure that without having proper preparation no one cant give their best performance in the written test. A large number of organizations selects the contenders depends upon written exam and interview. Some of the authorities select the suitable people based on their marks in 12th Standard. Get the current 12th Pass Govt Jobs 2019 from this page. At the top of the table, we have given all the latest stuff related to 12th Pass Government Jobs 2019. Around 2700+ vacancies are available. SO those who had completed their 12th Standard need to hurry up and apply for the openings because the competition for the 12th Govt Jobs 2019 is very bulky. The current article is only for the people who had completed their 12th. We all know about the benefits of government jobs. The Government provides Health insurance, Flexible spending accounts, Basic Benefit Plan, Thrift Savings Plan, Social Security, Life insurance, Employee Assistance Programs, Child and dependent care and much more advantages to their employees. Also, apply for the latest 12th Pass Govt Jobs 2019 from this page. Are you a 12th Pass Government Jobs 2019 seeker? if yes, then the present page help you a lot. Save your valuable time by checking this page. Because we have linked all the latest Govt Job Openings 2019 for the candidates those who had completed their 12th. We know that a large number of Government organizations are well paying to their employees. Based on your work automatically the pay scale should increase the time to time. So be patient and work hard to gain a job. So that you can easily maintain a good work-life balance. Those who had completed their 12th standard are only eligible to apply for the 12th Pass Govt Jobs 2019 which we have given on this page. Click on the above given apply link and check all the eligibility details. If you are eligible then without late apply from our website before the closing dates. We are sure that we provide all the accurate information from our website which is officially released by various departments. If you have any query related to 12th Pass Government Jobs then without late comment in the below section. After going through this page we hope the aspirants can come to an idea related to 12th Pass Govt Jobs 2019. Our suggestion is to start your career in the government sector and shine your bright future. Stay with our website www.freshersnow.com on regular basis.